Syria may have been a bridge too far for untrammeled executive war powers. That’s good for democracy. For decades, particularly since the Korean War, American presidents have insisted that they may deploy force on behalf of the nation without much Congressional oversight and, at best, vague Congressional consent. Call it the “resolution system,” for lack of a better term: The president deems a conflict worthy of U.S. involvement, but he wants to duck the formalism and high stakes of a de jure Congressional war declaration per the Constitution (Article 1, section 8, clause 11). So he asks instead for a “resolution” which expresses the “sense” of the Congress or something suitably vague like that. Next, the president insists that he is permitted to use force without Congress approval, as President Obama did in his Syria television address in September. This makes the Congressional vote “constitutional theater,” as Senator Rand Paul described the Syria debate, because no one really knows if the vote is binding. Ideally Congress votes for the war effort. Second best for the president would be that Congress backs down on a formal vote, and the president can fight with silent semi-approval in the legislature, as in Korea and Vietnam. Worst would be a clear Congressional vote against U.S. involvement, which the president then chooses to simply ignore. (As the first President Bush put it: “I didn’t have to get permission from some old goat in Congress to kick Saddam Hussein out of Kuwait.”) Such an outcome would threaten a genuine Constitutional crisis over war powers that would likely end before the Supreme Count. This has never explicitly happened, although Obama flirted with it twice: once in Libya, where the House of Representatives voted down U.S. involvement, and second in Syria recently, where the scheduled votes in the Congress were likely to go against the president before Putin “rescued” Obama from a serious separation of powers confrontation. Finally, the president refuses to accept the 1973 War Powers Resolution with its 90-day troop deployment limit, and tries to budget his conflict to avoid any special funding votes that might informally become a referendum on his wars. Both Johnson in Vietnam and George W. Bush in Iraq pushed this financing principle to the limit. The imperial presidency is a bipartisan phenomenon. Ideally, all this flim-flam keeps the political noise down long enough for the not-quite-declared non-war to be concluded on favorable terms. In turn, this reinforces the next White House occupant’s willingness to pursue “resolutions” instead of Constitutional war declarations. The constitutionality of this cyclic resolution system is murky at best, particularly given the clear war powers clause already in the Constitution and the Framers’ well-documented fear of kings (or presidents) going to war too easily. Like the recent efflorescence of presidential signing statements, war resolutions are executive branch legal freelancing with hotly contested legitimacy that has never been tested at the Supreme Court. 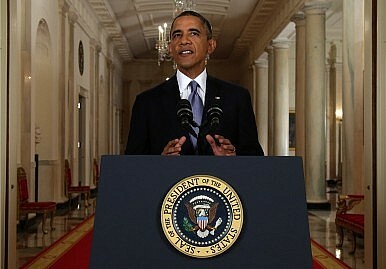 It is widely understood that wily Obama went to Congress on Syria only after the politics shifted dramatically against him, responding to the combined weight of Prime Minister David Cameron’s lost Syria vote in the House of Commons, the refusal of the UN and the Arab League to back strikes, and high public resistance at home to involvement. In early September, Obama really had only the French government – not even its people, who also opposed strikes and wanted a parliamentary vote – and the U.S. foreign policy community, with its unshakeable conventional wisdom that the exertion of U.S. power is good, especially in the Middle East. Had the British come through as expected, Obama would likely have stuck to the French path of claiming executive privilege to use force, regardless of legislative and public opinion. In this, the House of Commons’ no-vote, and Cameron’s respect for its decision, has done a great service to rule of law and the accountability of the executive branch in the West, and perhaps turned a page in the recent Western way of war. It should go without saying that elected presidents and prime ministers are not elected monarchs with a blank check. It may be that Western constitutions give executives wide latitude – although this is usually contested – but executive branch unilateralism is always distasteful, as it is essentially undemocratic. And when that unilateralism involves the use of major force, the killing of other people in the public’s name, it is simply improper regardless of the clever legalisms executive branch lawyers may spin.